Preservation lab technician Rebecca Thorn pieces together fragments of a fire-damaged record at the National Personnel Records Center. Marta O'Neill, preservation officer at the National Personnel Records Center in St. Louis, supervises the technicians who work with documents damaged by fire 43 years ago. 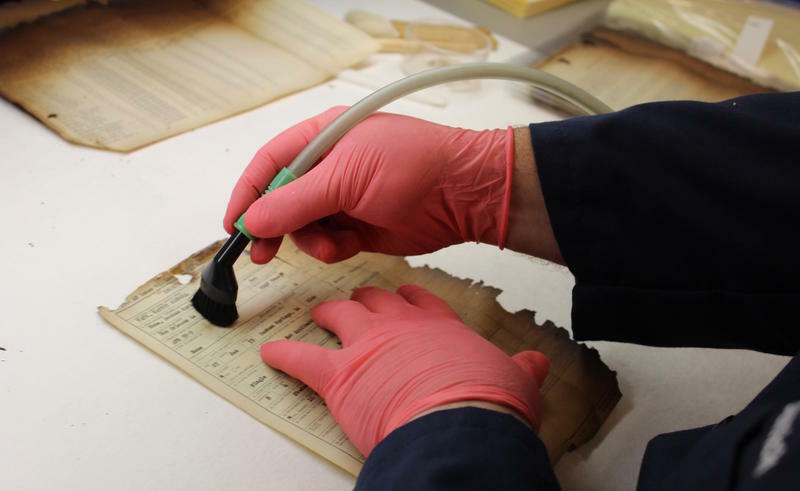 The preservation lab treats records that are damaged by mold. The archivists receive 300 requests every day for burnt records. Technician Sean Derrick uses a vacuum designed for surgery to clean ash from a document. Archivist Marta O’Neill was standing inside a warehouse-sized storage bay at the cavernous National Personnel Records Center, just off interstate 270 in north St. Louis County. Nearly 60 million individual military personnel records are stored at the site, but this storage bay is unique. It houses only B-files: the 6.5 million records salvaged from the 1973 fire at the center’s old facility on Page Avenue. That fire destroyed the records of 18 million veterans who served in World War I, World War II and the Korean War. Records that survived the fire 43 years ago at the National Personnel Records Center were charred and water-damaged. 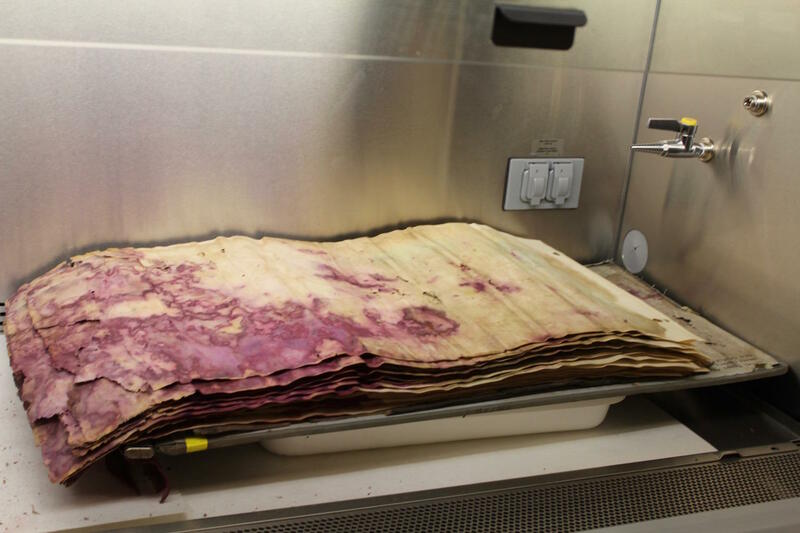 The surviving documents are brittle and sometimes moldy, damaged by both fire and the water that was poured on to douse it. 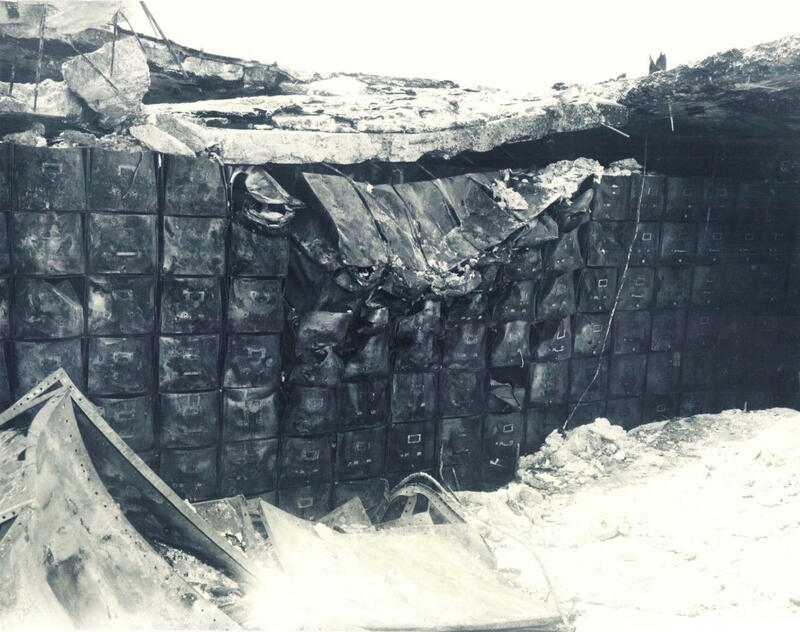 O’Neill opened a box of charred service records. Photographs aren’t allowed in here, but it’s an impressive sight. This space, one of two storage bays devoted to B-files, is capable of holding 250,000 cubic feet of records. Cardboard boxes are stacked row on row. There are 15 levels of shelves on the first floor and seven levels of shelves on each of two catwalks above. The temperature is kept between a chilly 35 and 45 degrees to help prevent further deterioration. 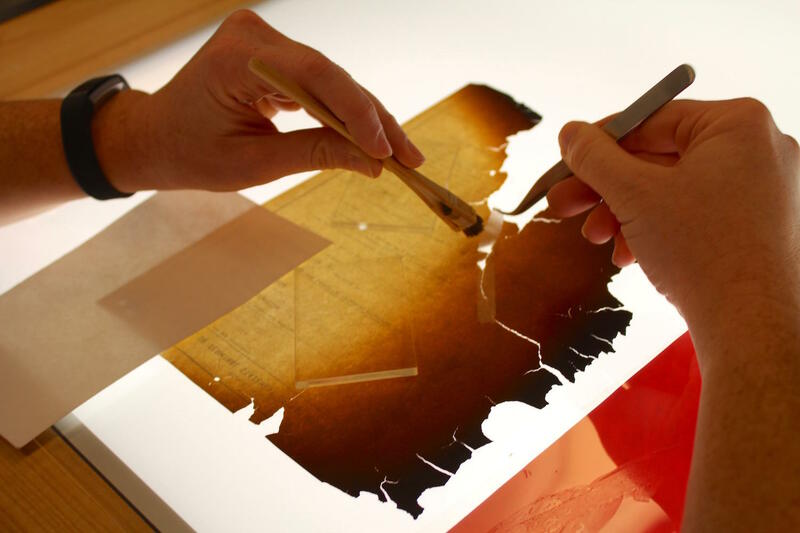 Listen to archivists discuss how they work with military records damaged by fire in 1973. 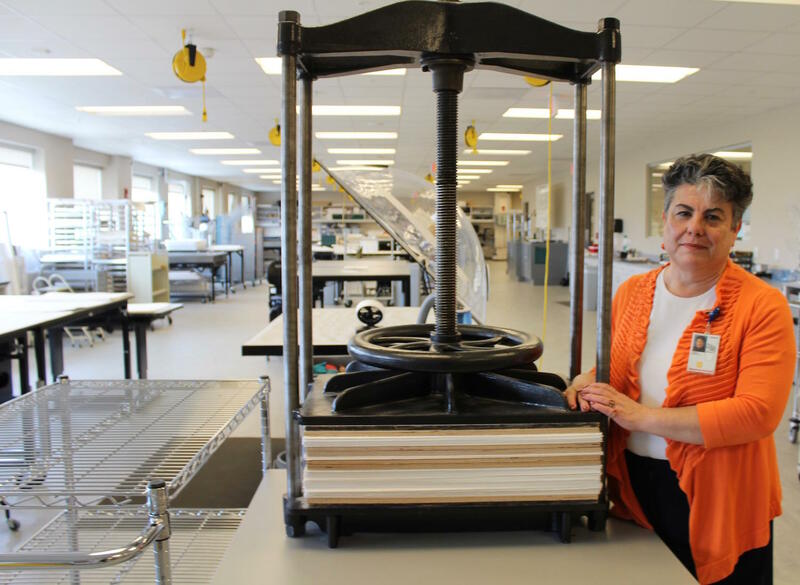 O’Neill heads the records center’s preservation lab, which employs 15 technicians. She said they operate like a MASH unit, doing triage on the nearly 300 requests received daily for these burnt records. Often, they’re from veterans who need documentation to qualify for VA benefits, like health care. Or, they’re from families who want to bury their veterans in a national cemetery. Some records are surprisingly intact. “If it’s in fairly good condition, and it just needs a light brushing to get light mold off, we’ll do that and send it to a reference technician to respond to the veteran,’’ she said. “If it’s in really bad shape, we might have to do a lot of treatment work. Technician Tom Schmidt uses infrared images to reveal words on blackened ash. The technicians can dab away dirt and mold with chemically treated sponges. They remove bits of ash with a medical vacuum used by surgeons. They mend tears and flatten pages so they can be put into flexible Mylar sleeves that can be easily photocopied or scanned. Forty-three years after the fire, they are still discovering new technologies that can help. 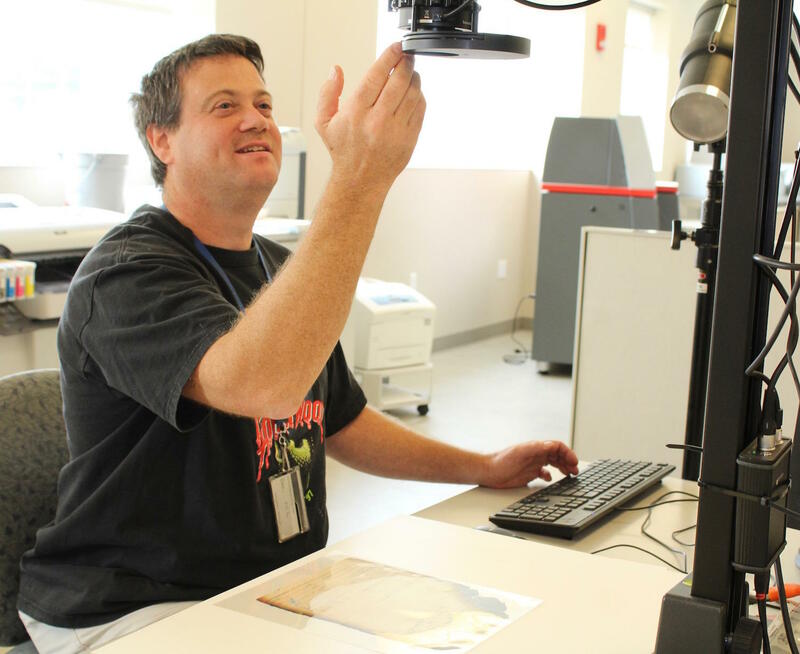 On this morning, preservation technician Tom Schmidt was using digital photography to enhance damaged records belonging to a Korean War Army veteran. 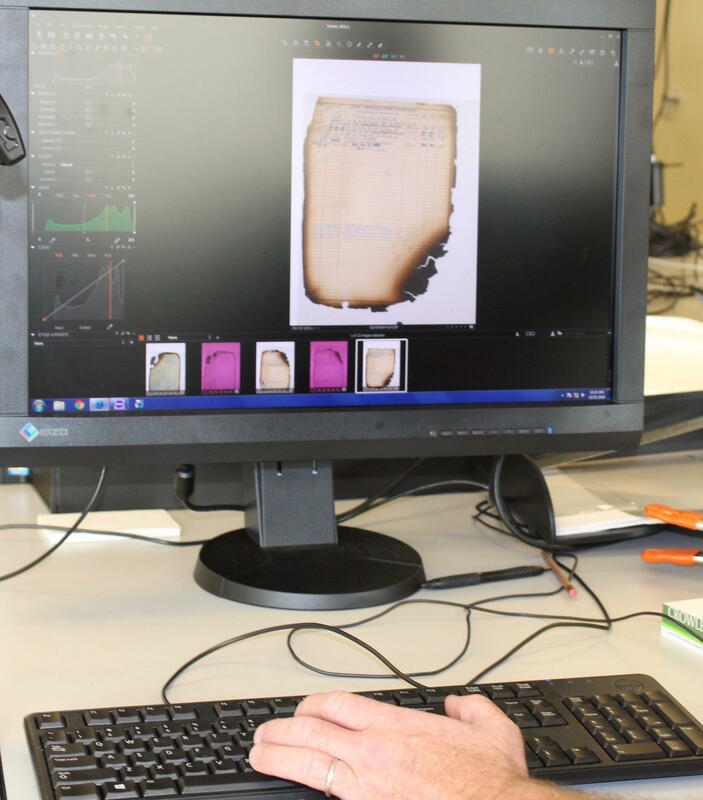 Preservation lab technician Tom Schmidt scans damaged documents at the National Personnel Records Center. As Schmidt adjusted the exposure, clarity and contrast of the image, the word “Kentucky” appeared in the ash. That could be important information for the requester. When Schmidt started working at the records center in 2003, this technology wasn’t available. “Who knows what future technology will come down the line and with the use of computers and digital imaging what we might be able to come up with in the future,’’ he said. That’s why it’s important to preserve the documents, even if they are unreadable today, the archivists say. 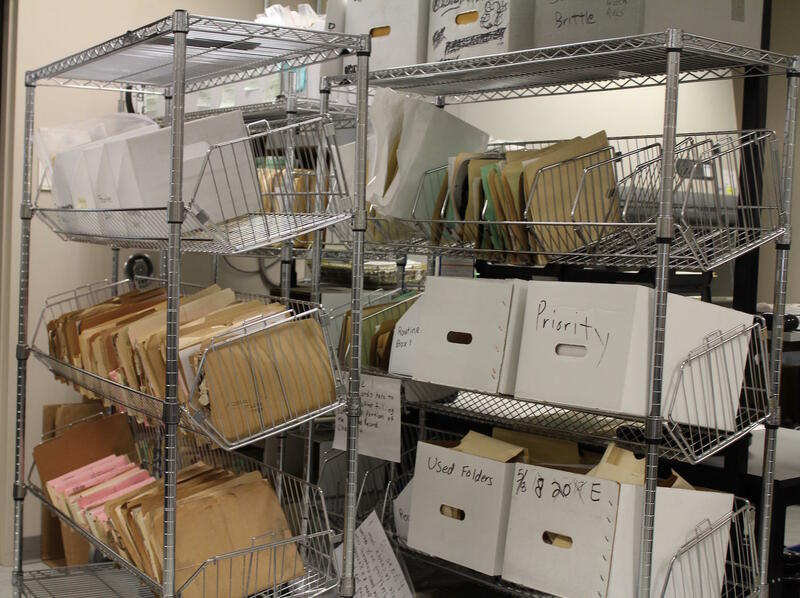 Before the records center moved to this building in 2011, these files were stored in a warehouse that had limited environmental control. The National Personnel Records Center is part of the federal National Archives and Records Administration and serves as the central repository of personnel records for the military and civil service employees of the U.S. government. Civilian records are housed in a limestone cave in Valmeyer, Ill. Unlike today's digital military files, these old paper files often contain photographs and personal letters. 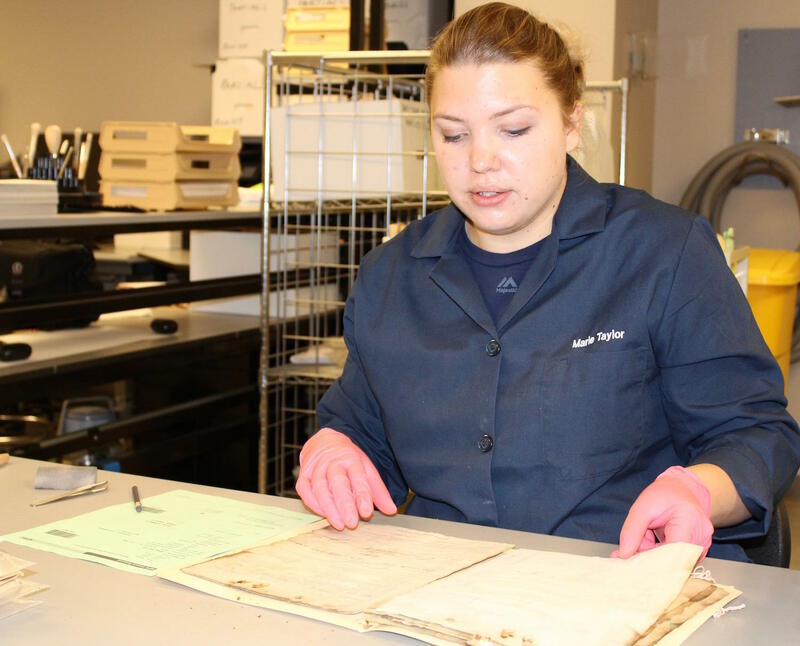 Technician Marie Taylor examines a fire-damaged military file at the National Personnel Records Center in St. Louis. Technician Marie Taylor, who’s 25, says she’s developed a connection to these soldiers who served their country decades ago. She was cleaning the fragile documents of a soldier taken prisoner by the Japanese during World War II. It was requested by the DPAA, the federal agency that recovers the remains of missing members of the U.S. military. The file includes official telegrams and also letters from the soldier’s family. Scott Levins, director of the records center, said that staff members appreciate hearing from veterans they’ve helped. “One of the first emails I got today was a thank-you from an 88-year-old Korean War veteran who was looking for his medals,’’ Levins said. The veteran wanted to thank the employee who had assisted him in documenting his service. He included a photograph of himself, wearing the service medals he'd earned 60 years ago. The center has paper and microfilm records dating back to the Spanish American War. Between 4,000 and 5,000 requests are received every day. About 45 percent of those requests are for a DD Form 214, a one-page summary of military service that is needed to quality for benefits. Military records are private and are not released to the public without the consent of the veteran. Records are considered archival 62 years after the veteran dies or leaves the military. Archival records are available to the public. Veterans who want to access their files can find details on the center’s website. There is no charge for the service. If a veteran’s service records were lost in the 1973 fire, attempts are made to reconstruct information by using records from other agencies, including the Veterans Administration. 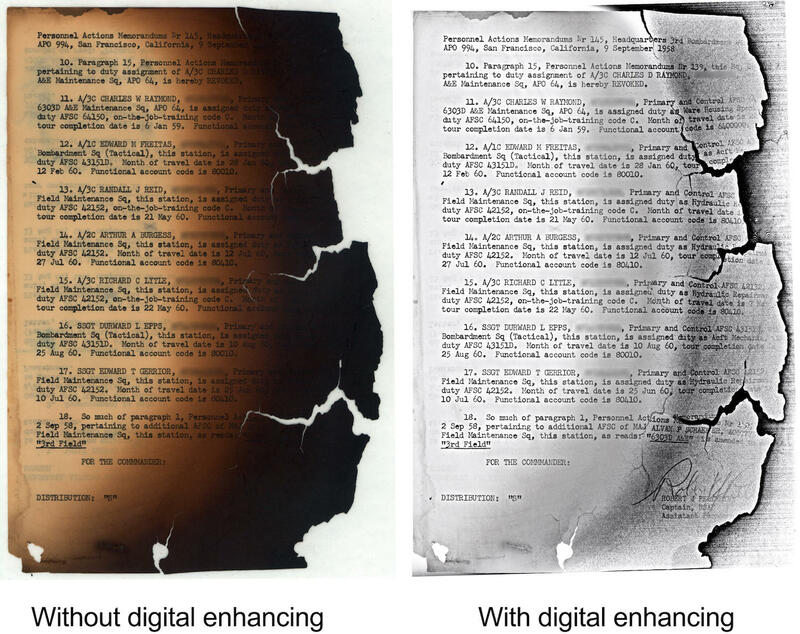 This example shows how a charred record can be digitally enhanced.